We are proud to announce that as of today the new version of the LookAround virtual tour web viewer is live. The update adds a new user interface to the web viewer, enabling users to easily switch between rooms and having important information of the property directly available within the tour. 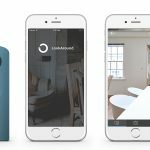 Virtual tours that have been recorded with the LookAround app prior to the update should automatically be available with the new web viewer. The new share dialog is accessible through the “Share” icon in the bottom right corner. 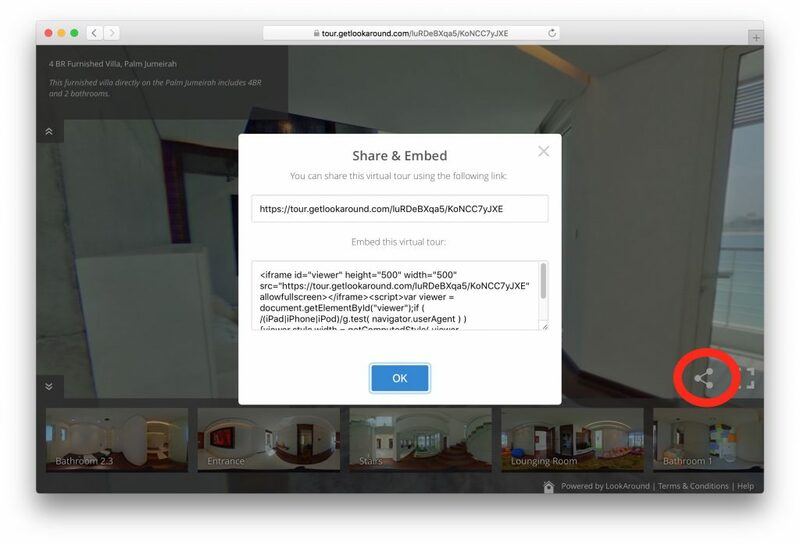 The share link will allow you to directly share a virtual tour with potential clients. Any room has a unique link, so you can decide which room you want to pick as a starting location. 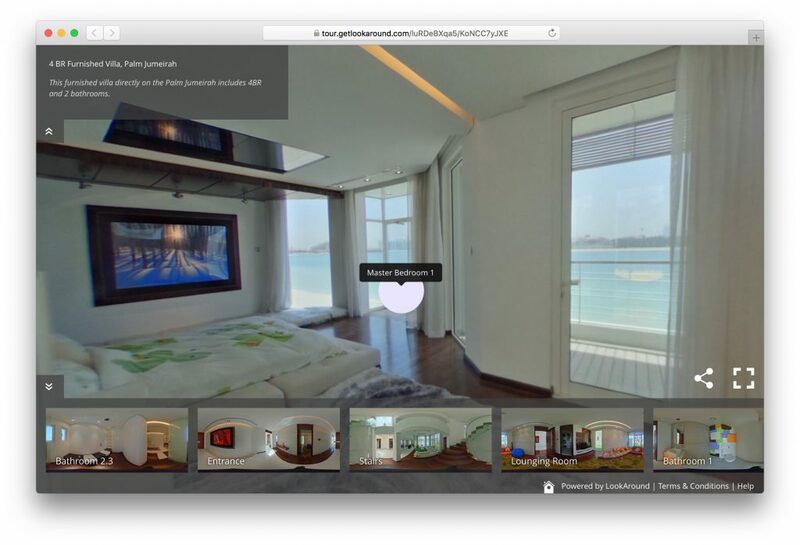 Additionally you can copy & paste the HTML code to embed the virtual tour into your website. While creating a virtual tour with the LookAround app you can set a title and a description. This information will now be displayed within the web viewer and can provide customers with additional information while viewing a property in 360. In order to maximize the viewing experience you can hide and show the virtual tour information by clicking the icon underneath. The preview images in the bottom row will display an overview of all rooms and can be used to directly jump to an other room within the virtual tour. When hovering a hotspot within a virtual tour the room name is being displayed in a little tooltip. This will help viewers navigate through a virtual tour. User interface elements can be annoying while viewing a property online and trying to navigate between rooms. That’s why we added buttons to hide and show any of the new elements with just a single click. We hope you enjoy the new features. Please use the comment section below to get in touch or to leave us your feedback! 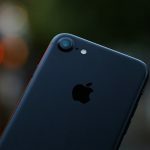 The next big update will affect the iOS app and introduce additional camera support besides the Ricoh Theta camera in order to enable even more people to capture virtual tours with LookAround.